Chris Paul of the Los Angeles Clippers and the Clippers bench react after Paul made a basket with one second remaining to give the Clippers the win against the San Antonio Spurs during Game 7 of the Western Conference quarterfinals. Chris Paul’s hamstring is the biggest source of uncertainty in projecting the Clippers vs. Rockets series. In the first quarter of an epic Game 7 against the San Antonio Spurs, the All-Everything guard seemed to injure his hamstring; but in doing his best Willis Reed imitation, he returned to play and hit the game-winning shot. Now, Paul is listed as questionable for Game 1. 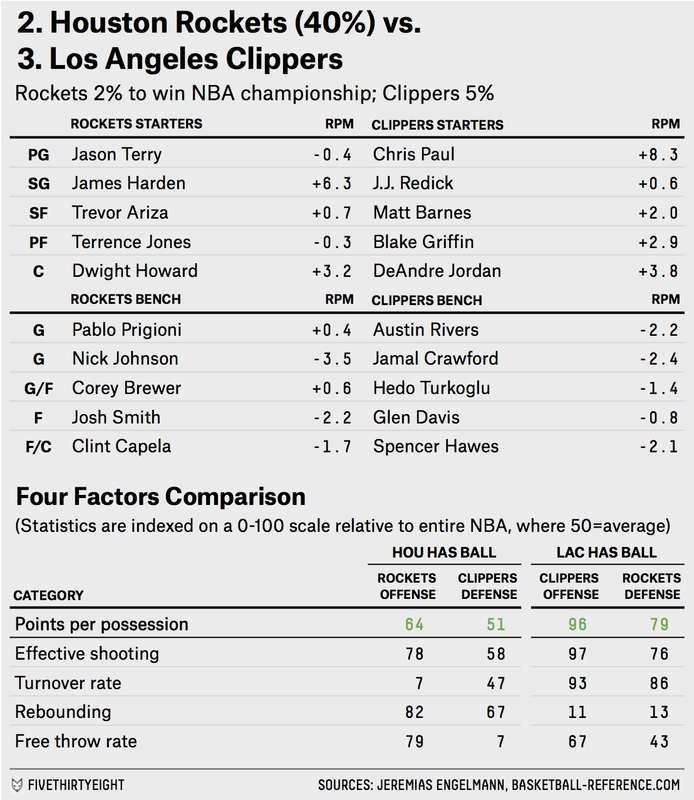 The FiveThirtyEight projections, using Real Plus-Minus numbers, gives the Clippers a 60 percent chance of getting past the Rockets, but it hinges on Paul’s health1 — the less he plays, the closer the series becomes. The Rockets will be riding James Harden, the prototypical scoring guard of modern analytics gurus. Harden boasts the best offensive Real Plus-Minus rating (+8.7) in the league. It’s no secret how Harden, like the entire Rockets team, likes to score: by pushing the pace, drawing fouls, avoiding long 2-point shots and taking an astronomical amount of 3-pointers. The Rockets led the league by a mile in the percentage of shots coming from behind the arc. Houston also thrives on specialization: while Harden does the scoring, Dwight Howard and other teammates make up for his subpar defensive skills. But while the Rockets’ offense is good, the Clippers’ is better. With Paul at full strength, the Clippers boast the second-most efficient offense in the NBA. Behind Paul’s passing — he led the league in assists per game, and the Clippers were second in assist percentage — the Los Angeles offense can seem unstoppable. Blake Griffin’s offensive versatility, and DeAndre Jordan’s blocks-and-boards game, will also help. But without Paul, the Clips would be severely handicapped. This projection has him playing about 31 minutes per night, down from 35 minutes per game in the regular season.